Republican Gov. 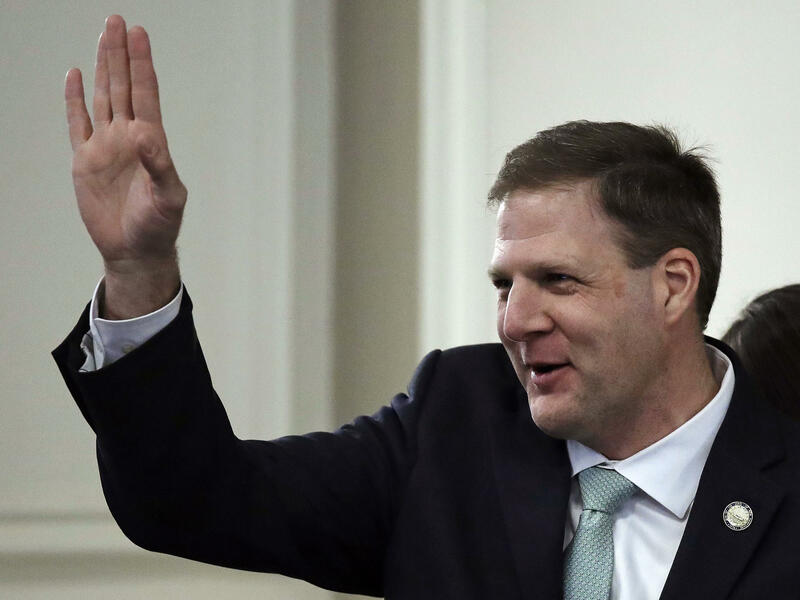 Chris Sununu waves during his inauguration ceremony at the State House in Concord, N.H., this January. The state's Republican governor, Chris Sununu, has threatened a veto. But with more than two-thirds majority support in both chambers, the legislature could override a veto, making New Hampshire the final state in New England to repeal the death penalty. "As I get older I realized for a fact we're actually all on death row and it's just a matter of time before our names get called," said Republican state Sen. Harold French, who voted for repeal. "When my name gets called, I'm going to go before the Lord with a huge basket full of regrets and misdeeds, just like you will. But I tell you what won't be in that basket of misdeeds. ... I did not turn a deaf ear to those who came and took the time to speak to us to get rid of the death penalty," he said, according to the Associated Press. There is one man currently on New Hampshire's death row and he may not benefit from the measure. The repeal bill won't apply retroactively to Michael K. Addison, who was convicted of the 2006 killing of Manchester police officer Michael Briggs. But capital punishment supporters worry that once the state abolishes the death penalty, the judicial system will be loath to apply it to Addison. "The day that this passes and is signed into law, Mr. Addison's sentence will be converted to life in prison," said state Sen. Sharon Carson, according to the AP. As New Hampshire Public Radio reports, Briggs's widow, Laura, opposed the push to abolish the death penalty. "It's not about an eye for an eye or revenge," she said. "It's about protecting our society from evil people that do evil things." It's been 80 years since New Hampshire last executed someone, when in 1939, Howard Long was hanged after he molested four children and killed two of them, including a 10-year-old boy. The state's lawmakers have voted to repeal the death penalty twice this century – once in 2000, and once in 2018 — but in each case the governor vetoed the bill, the New York Times reported. Last year the state Senate failed to muster the 16 votes needed to override the veto. This time, the Senate has the numbers. "Governor Sununu continues to stand with crime victims, members of the law enforcement community, and advocates for justice in opposing a repeal of the death penalty," his office said in a statement, according to the Washington Post. Once the bill is signed by the House speaker, Senate president and secretary of state, Gov. Sununu will have five business days to either veto the bill, sign it or let it become law without a signature, the Union Leader reports.